The Gensteel sword, if I may wax a little philosophical, is a fine example of the paradoxes of war. It is a beautiful thing to behold. Elegant and tapered, with gracefully curling tips on the guards and a sophisticated, spade-shaped pommel. It's a paradox because it was just this type of weapon that was used in hundreds of battles across England and France during the 12th century. Spelled out, the paradox, of course, is that a noble, dignified sword was responsible for the deaths of hundreds of thousands of brave men on both sides. But if life, as the Budhists put it, is suffering, and we must welcome calamity, as the Daoists state, then this sword is a function of the natural world, and, therefore, of even more beauty than it's purely physical aesthetic. Fine. Let's examine the more pedestrian points of this sword. (editor: knock off the flowery language, too.) Sigh. Oh, the slings and arrows that fine. This sword is awesome. It's graceful, strong, noble and powerful. (editor: That's the spirit). The two most noticeable parts of the sword are the guards and the grip, in that order. 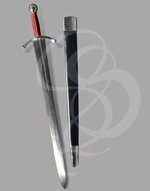 The guards slant downward slightly and curl beautifully at the tips, giving the sword a stately appearance. 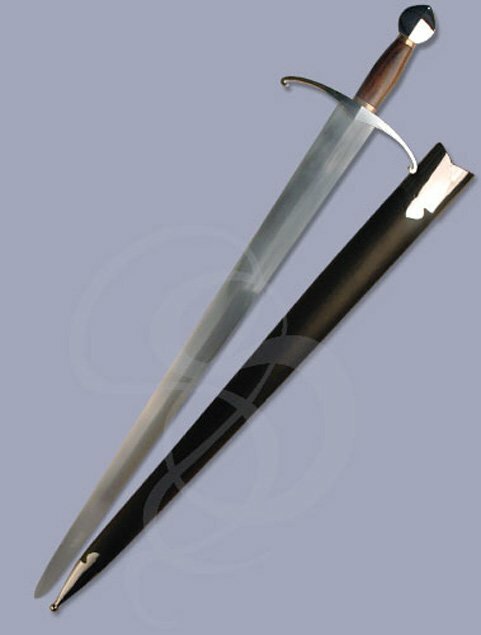 A polished wood guard, bulging slightly at the center, adds to the formal appearance of the sword. The highly polished, spade-shaped pommel has a decidedly French or Norman look to it and continues the sophisticated theme. A decorated leather-wrapped wood sheath comes with this sword. 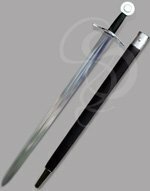 This is very similar to an Oakeshott Type XV sword (for those of you who follow that sort of thing), with the exception of the pommel, and that the blade doesn't taper quite as much as most XVs do. Historically, this was a soldier's sword. But I have to think that it was reserved for the upper ranks of soldiers, or possibly for nobility traveling with the troops. It's too good-looking a sword for the average trudge to afford. 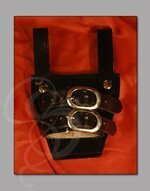 Comes with a leather-wrapped wood scabbard. This Sword made my Sister and Brother in Law's Life! This sword was supreme! It didn't have a sharp edge (safe for kids and no need to upkeep much). I had it engraved for my sisters wedding and they raved about it to everyone they saw afterwards. I feel like the best gift giver on earth because of the supremacy and originality of this product. Beautiful and elegant. Bought as a gift for my son. He will love it! Fine sword, looks very nice with a sharp taper. Diamond pattern, so not a light sword(about 3.5 lbs.). Seemed a little blade heavy, so swapped pommels with a Crecy sword, this brought the balance to perfection for me. very stout blade cuts very well. As with all mine, I covered the handle with leather and risers. Overall a very good reproduction of the Sword of Aurey. Beautiful sword. I had it engraved for a birthday present. It was a big hit. The engraving came out awesome. Quick turn around too.